Washington DC, December 14, 2007 -The National Security Archive yesterday rebutted the government’s argument for dismissal of the Archive’s lawsuit in federal district court seeking to recover 5 million or more Executive Office of the President e-mails that are missing from the period 2003 to 2005. The Archive’s latest filing comes in a lawsuit brought against the Executive Office of the President (EOP), the White House Office of Administration (OA), and the National Archives after White House spokesperson Dana Perino acknowledged this year that over 5 million e-mails generated within the White House from 2003-2005 are missing. The lawsuit seeks to compel the Archivist of the United States and the heads of the EOP and the OA to fulfill their responsibilities to restore e-mails improperly destroyed and prevent future destruction. A virtually identical lawsuit was subsequently filed by Citizens for Responsibility and Ethics in Washington (CREW) and has been consolidated with this case. Last month, Judge Henry Kennedy granted a temporary restraining order, directing the EOP to preserve all e-mail backup media until the case is resolved. “After failing to manage its federal and presidential records properly, the government now is trying to use its own unlawful conduct as a shield against this suit. The fact that there may be presidential records on the same servers and backup media as the federal records we are trying to preserve is not a reason to deny us an opportunity for relief,” explained attorney Sheila Shadmand, from the law firm Jones Day LLC, which represents the Archive. The National Security Archive, an independent non-governmental organization based at the George Washington University, brought the original White House e-mail lawsuit (which included a wide range of scholarly, library and public interest co-plaintiffs) against Presidents Ronald Reagan, George H. W. Bush, and Bill Clinton. That lawsuit produced landmark rulings in the early 1990s that e-mail had to be treated as government records. 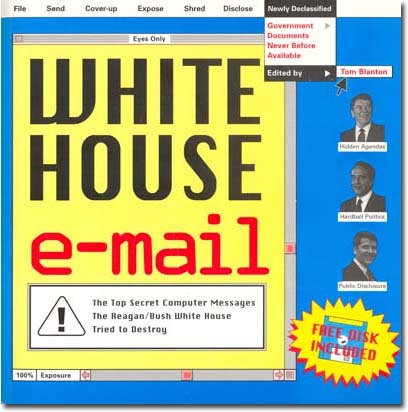 Those rulings led to the preservation of more than 30 million White House e-mail messages from the 1980s and 1990s.